I have been fussing over my seedlings for some weeks now and the time has come to share this obsession. I started before Christmas but I now realise that was too early. I have a heated windowsill propagator and managed to germinate a few reluctant-to-get-moving seeds, but subsequent attempts have overtaken them, and looking far healthier into the bargain too. Twice a day I coo at them, clean their clear plastic lids and carefully water them. Indeed, today the largest of the Jalapenos have been potted on in order to make space and are to spend their first night on the kitchen windowsill, their first night out of the nursery. I hope they don’t catch a chill. Already germinated I have Jalapenos of course, my ‘mystery chilli’ that I call Sprites (both from seeds obtained form last years peppers), Hot Lemon (gifted to me by the very charming Elin of Stockholm) and Bhut Jolokias which were mentioned in an earlier post; they are coming on fine despite living in a world far removed from their native Assam. Today I started some Cayenne seeds off, and no doubt next week I will start something else. Jalapeno, planted as a seed on January 3rd. Good hey? Tell somebody about this post, click on one of these . . .
Is this the hottest Jam on Earth? It’s made using the hottest chillies on Earth so you might expect it to be. 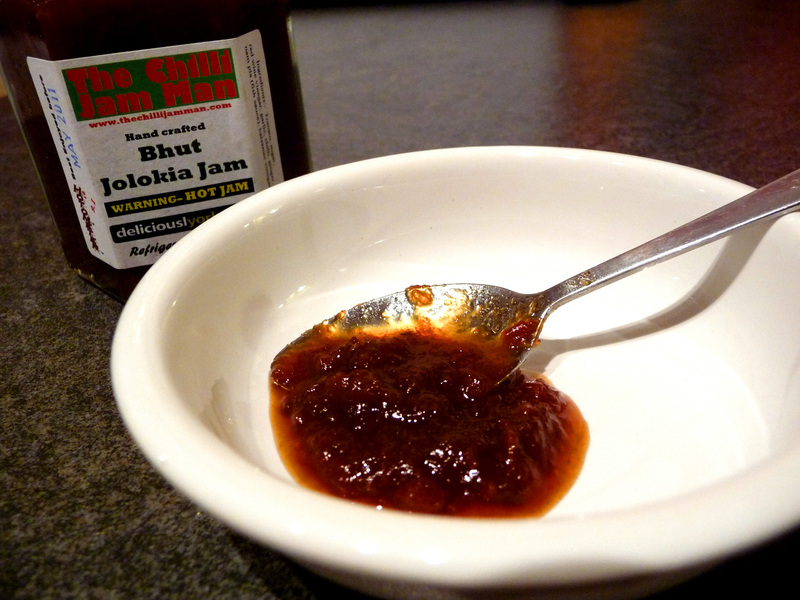 But having tried The Chilli Jam Man’s jams before I knew it would be more than just hot, or even mega-hot. I expected it to be special too; and I wasn’t disappointed, in either way. When I opened the jar I was struck by it’s rich dark red colour and an aroma which said more of tomatoes, balsamic and red wine vinegars, ginger and garlic than just chilli. There’s also Nam Pla fermented fish sauce in there too, which I suspect is responsible for bringing all the flavours together so harmoniously. I have been thinking about how best to test this jam for a little while now. Having opened it, though, I realised that there was now no other option than to spoon a generous amount into my mouth. The flavours filled my mouth and were carried around my palate with just the right level of sweetness, while a gentle heat slowly grew. It took some time for the heat to develop fully, by which time I’d gone for a second spoonful; it’s that tasty. The front of my tongue was now burning and my face, I suspect, was turning red. At no time was it too hot though. As the heat started to subside, after a couple of minutes or so, I finally doused the flames with a glass of whisky, left over from last night’s Burn’s Night supper, half expecting to spontaneously combust. 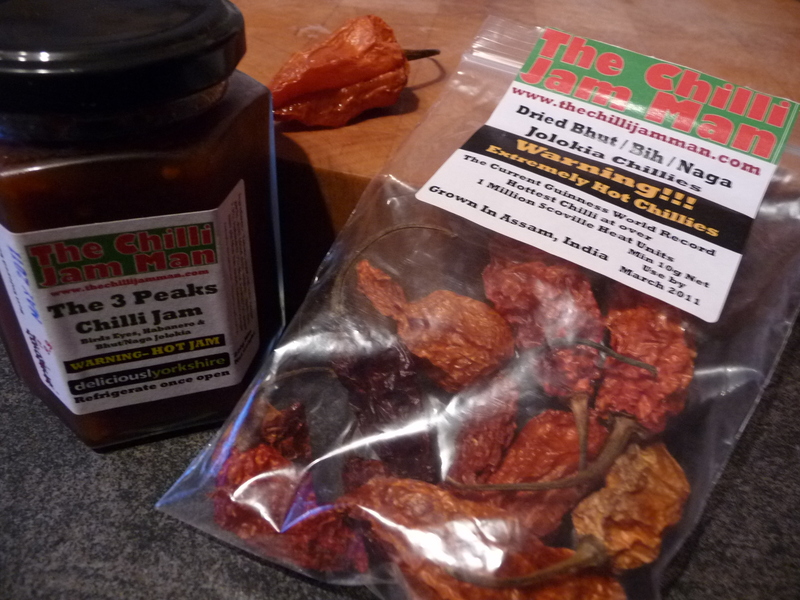 The Chilli Jam Man can take the hottest chilli on Earth and create a gourmet treat. You could eat it with anything; I really cannot think of any food that wouldn’t go well with it but I’ll let you know if I find one. A few days ago I bought some fresh Naga chillies from an asian grocers, in Loughborough, opposite the Mazda garage. The shopkeeper lamented that they weren’t hot due to being ‘young’ but his assistant smiled at me and said, ‘Yea, they’re hot’. I tried one on a pizza a couple of days later and found myself agreeing with the assistant. I wanted to do something special with them. This was, after all, a significant find; fresh Naga, in January, and not far from where I live. On Thursday I visited my friend’s market stall where he had a superb looking pork shoulder, which had still been a pig a matter of a few hours earlier. That was it, decision made. Finely chopped pork. I prefer shoulder because it has just the right amount of fat in it. Chop it so that nothing is over a centimeter in size. Do not mince it though, it’s just not right. Generous amounts of black peppercorns and whole coriander seeds. Crush them, but not into a powder. Garlic. Grind this with salt to make a paste. Original Maltese sausage is quite salty as the salt was in there to preserve the pork. Now we have fridges you only need to add enough to suit your tastes. Fresh parsley. Add loads, as much as you can get your hands on. Chillies. I used my fresh Naga but use whatever you have to hand. One chilli per pound of meat has a noticable presence. But this, of course, is entirely up to you. You will find that the peppercorns provide heat as you first put it into your mouth and then the chilli slowly moves in warming and developing the other flavours nicely. 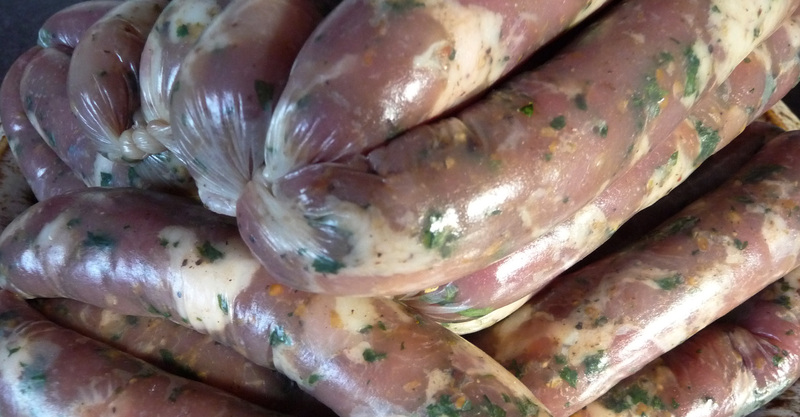 It’s a sad, but true, fact that not everybody has a sausage-making machine. Mine is simply a nozzle attachment that fits onto a mincer. 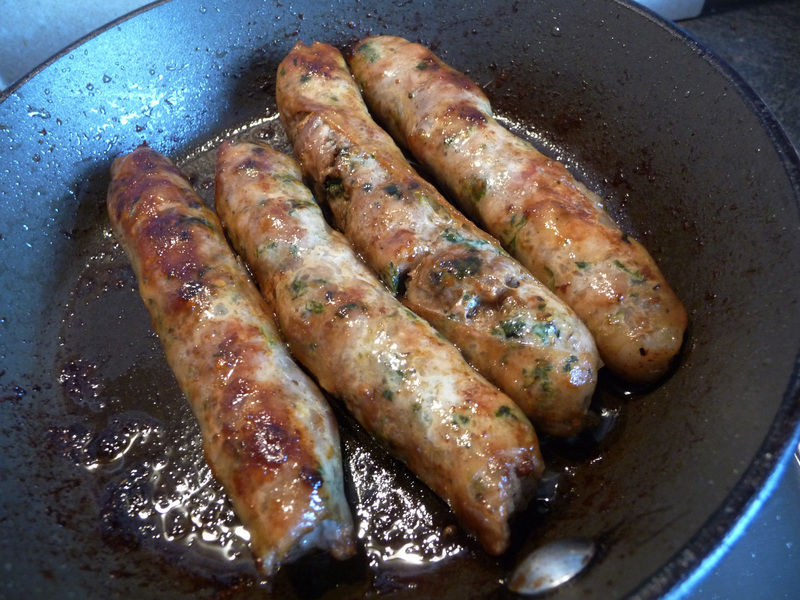 But don’t despair, you can still enjoy this sublime sausage by patting small balls of the mixture between your hands to make ‘patties’. Have a go at making these yourselves, and let me know how you get on; I’m sure you won’t be disappointed. After only nine days in the propagator I have my first Bhut Jolokia seedling. 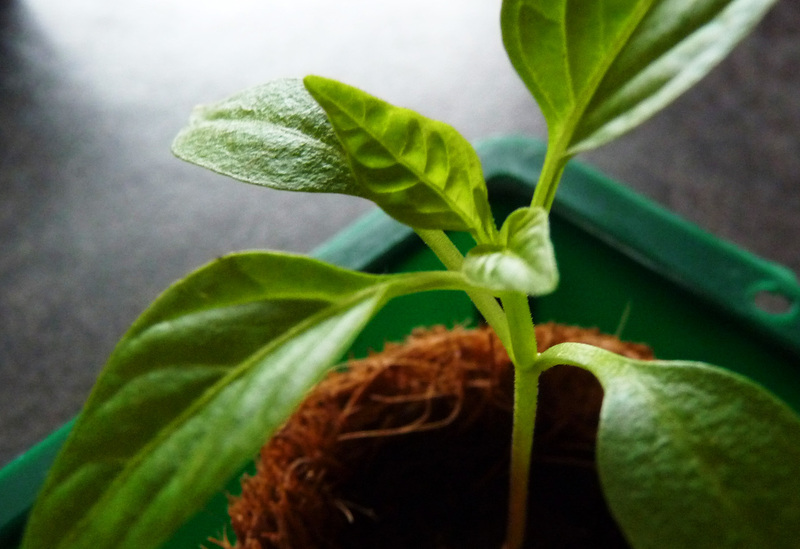 I placed the seed in some John Innes Seed Potting compost in a mini coir pot and onto a heated windowsill propagator, with a view of (far from) tropical Thurmaston out of the window. This was on January the 9th and I wasn’t expecting to see anything until well into February. I must have unwittingly created the perfect conditions. All I can say is that Assam is nothing like I’d imagined it to be. Further along the windowsill I have some others which have been languishing in this sub-tropical environment since before Christmas, so I think that I might have a bit of ‘recycling’ to look forward to. It’s Saturday night, you’ve had enough beers and you’re feeling peckish. 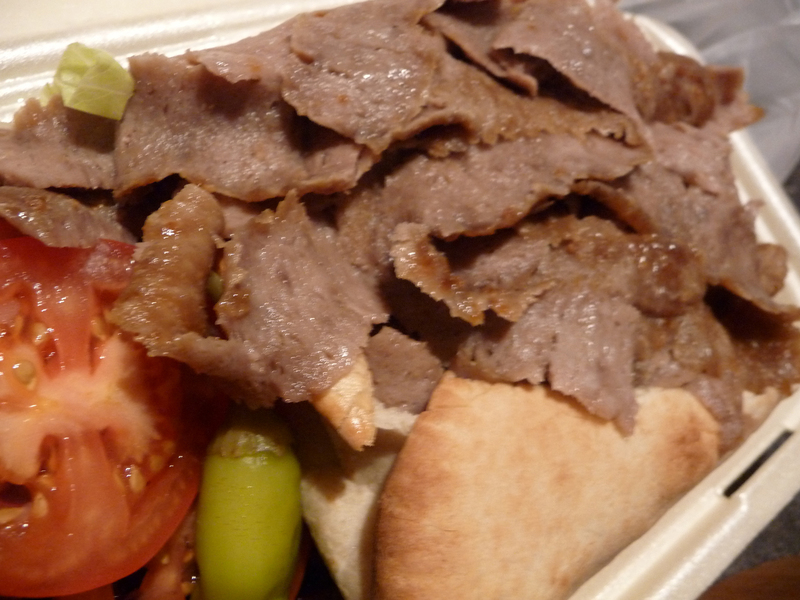 Up and down the country proper men (and women no doubt) will lurch into the nearest kebab house for that traditional Saturday night supper, the doner kebab. And when you’re drunk there is only one size of doner, and when asked if you’d like chilli sauce on it you answer, ‘Yea, loads’. All you have to do is remember to put a toilet roll in the fridge ready for the morning. In the interest of research I bravely answered ‘No thanks’ to the offer of chilli sauce. Because, last night my friends, I staggered all the way home with my kebab for the Chilli Sauce Kebab Trials. I had spent the day gathering three very different sauces to slop onto the beer-monster’s ultimate ambrosia. 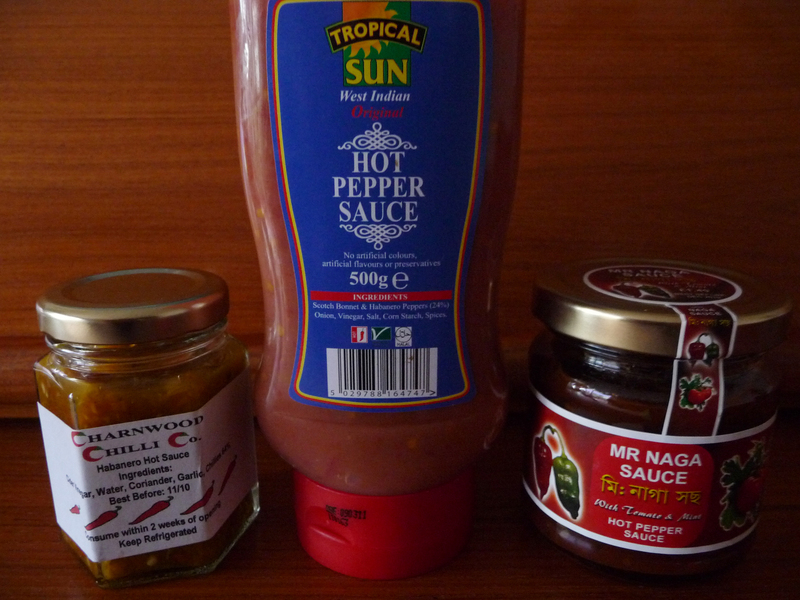 I had Tropical Sun’s Original West Indian Hot Pepper Sauce, Mr Naga’s Hot Pepper Sauce and Charnwood Chilli Company’s Habanero Hot Sauce. All three sauces were applied liberally and the whole lot noisily scoffed, taking time to appraise each one and it’s particular affinity with it’s host, the doner. The Mr Naga Sauce is 20% Naga Morrich so has a little kick to it. It also has tomato and mint and ‘spices’ which make it very much an Indian style condiment; very nice but not the best accompaniament to a doner. Charnwood Chilli Co’s Habanero Hot Sauce is quite refined with garlic and coriander very much in evidence. It went very well with the lamb and god-knows-what-else is in a doner but somehow it’s 64% Habernero content didn’t amount to the kind of heat that you would expect. Very very tasty but again not quite right for this job. Finally came the Tropical Sun West Indian Sauce with 24% Scotch Bonnets and Haberneros. As you can see it comes in a great big squeezy bottle which makes lovely rude noises when applied. Its a bit gloopy and plastic looking but has plenty of heat. It’s also very good value for money; all three sauces in the comparison cost the same, meaning that you can be firing this one onto your food long after the others have become spare jars. A clear winner. To be fair though, all three were very tasty indeed and I will give the others a proper, less drunk, review later on. 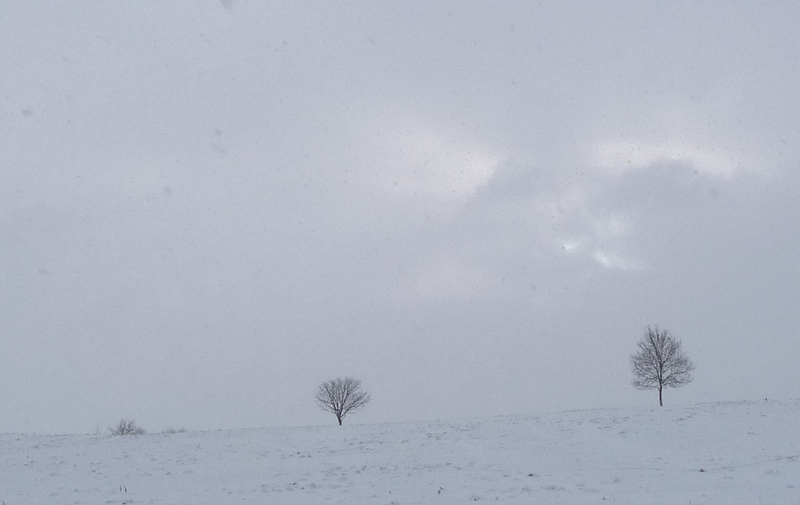 We’re just back from a ‘Delightful weekend in the country’ in the Peak District traipsing through snowy vistas like this one and mellowing by the real fires of the Rutland Arms Hotel, Bakewell. Max’s Indian Restaurant in Bakewell is a great place to warm the cockles when you have spent the day being blown about by blizzards and knee-deep in snow. We were the only people in there on this particular evening and, being on the eve of a three-week close-down, there was a happy chilled atmosphere as we were given a table next to a roaring fire. Although many of the usual suspects were there to be found on the menu something about it suggested that this place was a bit different to other small-town curry houses. What, for example, was ‘Chazni Zayka’? A charming waitress took our order and presented us with our wine, which not suprisingly, was a tad cold, but in a sub-zero arctic winter, what isn’t? And, of course, there’s always the fire to warm it through. Tandoori Chicken Razzela, Lamb Chazni Zayka and Jeera Rice appeared at our table at the half-bottle and we were instantly impressed; it looked good and mmmm smelled so good too. The first thing to strike me was how fresh tasting everything was, with whole spices discernable in the rich gravy, which was well, gravy coloured and not dyed in flourescent nursery colours, which most Indian restaurants seem to think we expect of them. In short, it was a fine meal and the Razzela had enough chilli in it to make me happy, although the lamb in the Chazni Zayka was the star of the show; perfectly cooked and bursting with flavours. Our host joined us after the meal and was very happy to talk about his food. I asked about some of the dishes; traditional Punjabi cuisine is the main influence but he admits to making it more comtemporary and even ‘making some of it up’; he was, after all, born and raised in Derby. Freshness is very important at Max’s and their location, with its lack of asian grocers, has influenced their style. I particularly liked the use of chiffonaded spinach, a perfectly fresh and light substitute for cilantro. I am told that the Jalfrezi is the hottest dish on the menu and next time that’s what I’ll be having. You might also want to sample the almost perfect homemade Kulfi, especially if you ask for extra chillies. Contact them on 01629 814336. A little late I know, but there are a lot of children in the world that have to be done first I realize. But look what he left me . . . Many thanks to Julian, who clearly enjoys seeing me suffer. The ‘3 Peaks Jam’ is sensational. After spooning some into my mouth I was thinking more along the lines of ‘3 Peak Challenge’ ; the chillies really do hit you one at a time. There’s Birds Eye, Habanero and Bhut Jolokia all lined up for the heat but it also tastes delicious, making it very difficult to go easy with. It has been produced so skillfully that at no time does it overwhelm your taste buds. Not sure about the ‘jam’ label though, I’d say it was more like a pickle. I will need to go out to buy cheese. Then there was the packet of dried Bhut Jolokia, or Ghost Chillies as they are sometimes called. The packet warns you that they are extremely hot chillies, indeed, they are reputedly the hottest in the world. I have been keen to try these ever since I first heard about them, partly out of curiosity, but also because of the media hype surrounding them. You hear stories written to strike fear into their readership, like families in India adding spice to the whole family’s food for weeks on end by merely touching it with a Bhut. Or that you could use one instead of a sheepdog to corral your animals. I’ve always been one to make my own mind up about things. I took a bite out of one and chewed, and swallowed. it was indeed very hot and I at once felt most peculiar. But my ears didn’t drop off, or anything else for that matter. Its not really surprising that I should a feel little odd for a moment, nature intended to render these chillies inedible to the likes of us, preferring them to be eaten by birds, which are impervious to the effects of Capsaicin. But seconds later I was left enjoying its taste and its steady and impressive heat. It’s flavour though is difficult to describe, other than that of dried pepper and something slightly pondy. I will explain further when I have tried it more extensively.